It's another one of those tightening-the-belt Christmases for the bf and I, and so most people on our lists will be getting at least one homemade present. It's more meaningful this way--I love getting gifts that the giver made personally--but there's always the concern that you're putting all this time and effort into making something the reciever will find repulsive, especially if you're making it for someone who doesn't have similar tastes to yours. 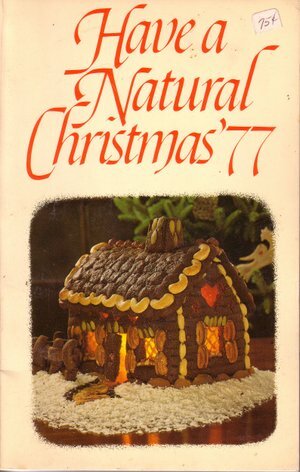 Which brings us to a little craft book I have called Have a Natural Christmas '77. I was certain this book would be a treasure trove of fugly crafts made from pine cones, sticks, beans, feathers, and seeds. Once I investigated futher, it wasn't all that bad--the book was put out by Rodale, publishers of books and magazine titles such as Prevention, Men's Health, Women's Health, and proponents of organic farming since the early 40s (another of their titles you might have heard of is An Inconvenient Truth). It actually seemed touching that this well-intentioned publishing company put out a little book of natural Chistmas crafts. Although the more I contemplate the cover project here, a gingerbread house with cashews as the snow on the roof and pumpkin seeds as, uh, pumpkin seeds on the chimney, the less I feel like eating, so thank you, Rodale, for that 30-year-old diet tip at holiday gorge time. But as you're about to see, crafting got worse than natural ideas in the time of disco fever. I'm all for recycling and being DIY and I'm all for rustic decor, but this book reminded me about some of the just-plain weird crafts grownups were always making us kids do back then, when we didn't know any better. Here's an idea where you're supposed to hang clay flowerpots upside down from red ribbons as "bells." Here's one where you slice logs into disks then drill holes into them to make tabletop pencil holders. A-ha! Directions to make an "offbeat bag" for a youngster out of "denim pants" or as we now know them, "dungarees" "jeans." How about this suggestion: "If you'd like to make a gift for a kitchen or dining room wall, why not design a handsome bean collage?" Only in the '70s, folks, only in the '70s! I can actually think of several reasons to not do that. The book does have a few recipes I'd try such as Christmas pumpkin bread, but less appealing ones include "Carrot Pickle," an all-raw fruitcake, and "The Snowdrift Special," which is buttermilk, unsweetened pineapple juice, lime juice, and honey served over crushed ice with a grated lime rind. WHAT? I can't even begin to understand that. But at least a lot of natural supplies tend to match each other. When the crafter went beyond her back yard or pantry for supplies, and out to the craft store, she raised the stakes for potential crimes against good taste. Join me as we remember a time when old people could still afford to live in Central Jersey because the taxes weren't yet prohibitively high. When I was growing up all of our neighbors were old people (except the kids behind us, one of whom my brother married). Across the street we had the Johnsons, a lovely pair of white-hairs who used to feed our cat and call her Whitey. It was a little racist because her name was Snowy, but that's OK. I always thought dapper Mr. J looked a little like Maxwell Smart, and he would say things like, "Oh dear, bread and beer, if I were rich, I wouldn't be here." Which of course made no sense to an 8-year-old who had been made to visit her elderly neighbors. Mrs. J had a square jawline and kind of a narrow bouffant short hairdo. In the '70s, Mrs. Johnson was big on crafting Christmas decorations, and the main components for them were Styrofoam forms, glitter, sequins, spangles, and beaded straight pins, and each individual craft would utilze many different colored combinations of those elements. 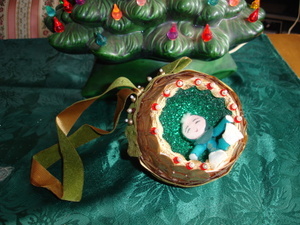 My parents still probably have packed away various tree ornaments she made, and there was also a small Christmas tree made from a styrofoam cone onto which circular pasta and sequins were glued (a hybrid of natural & artificial! 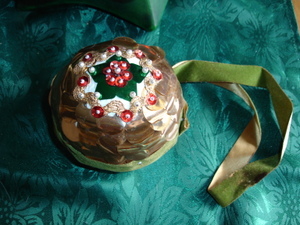 ), which was then spray-painted gold. It was possibly also bedecked with rickrack as garland. I'm not sure if this was a school of decoration- making back then as seen in Family Circle, or if Mrs. J was a pioneer in this style. If so, maybe we can consider her an outsider artist. Mr. and Mrs. Johnson are unfortunately long gone, but today I salute Mrs. J's creative spirit with the one relic of her handiwork I've inherited. (If you've made it this far, you should really enlarge these photos.) This number is about the size of a baby's head and features velveteen ribbon, spangles, sequins, four different kinds of beads, glitter, golden rickrack, and a little elf. Finally, if you haven't yet been inspired to make your own presents, here's another one of Rodale's suggestions. Don't say I never gave you nothing. Last year Laura and I had no money (I was working at McDonalds and she at a graphic design place for 9/hr) and so she ended up making some ...microwave...deer corn... warmer thinggy. OMG!! Because I am older than you kids, I am very familiar with all that stuff. Make ornaments out of styrofoam? Yup. 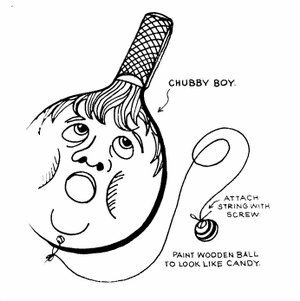 (made dolls of it it and pins and beads, too). Make weird potholder things? yep. Make extremely 70s wall hangings of like, dogs, out of yarn and such (I just have vague memories of this - I think I've blocked it out due to the horror)? Do MACRAME? And yes - honestly - make things with beans? All, sadly, yes. My mother still does stuff like this. She crochets, which sounds like it would be love but she makes things like these toilet paper covers that look like dolls (something like this: http://www.crochetnmore.com/toiletpaperdollcover.htm). It's truly truly frightening. My mother was a big crafter- mostly in the crochet & ceramic veins. In fact, she made a tree for my grandparents similar to the one glimpsed in the photo above. I have a microwave deer corn warmer thingy and I use it all the time in the winter! Because I have a habit of living in drafty apartments. How about the owl-on-felt "still life" with the owl made out of a certain shape of "macaroni," plastic googly eyes, and pretzel sticks? Am I really that much older than Cokane?? First-very jealous of your ceramic tree...I have one but basically allll the bulb ornaments are busted...One from my childhood. I love that tree. Any thoughts on where to get replacement bulbs. And second did you ever do string pictures. You wrapped string around little nails and voila a picture of a house. I have very distinct memory of making those and latch hook rugs. OK i think these are AWESOME. Srsly. 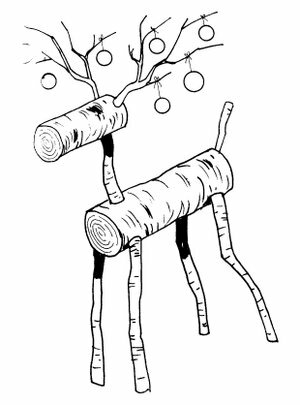 I've seen those log reindeer for sale this season at some stores. awesomest three words i've heard all day. i'm kind of worried that i just spent like 10 mins googling 'bean collage' to find one of those horrible 70's ones with pasta and beans stuff. no luck. alas. I had one of those wooden reindeers when I was little and loved it, so naturally I was scoffing at your criticism. That is until you described the snowdrift thing, which sounds like vomit in a glass and immediately made me queasy. I do have to second Elizabeth's recommendation for food gifts though. That way, the person doesn't have to deal with the tricky situation of either regifting or feeling obligated to display the gift when you visit. Kettle & Therese, I had never heard of these deer corn thingies, but our house is drafty and luckily we have them! I need a full-upper-body one, please. Elizabeth, oh I know exactly what you're talking about. All of my Nana's friends made those toilet paper cozy dolls (and there was always one on her toilet tank), and/or bicolored crocheted booties, my brother and I would get pairs every year and never wear them. Alison, so they've gotten to the bean collages, too. I do not miss the wmsdouches. Beth--now I have two of those trees! The one in the pic is old (belonged to another now long dead neighbor, I hadn't made that connection til just now) and the bf's gma made the other one. I think you should be able to find the bulbs at any craft store, since people are still making those trees today. I don't think I ever did a string picture, but remember them. all, i actually like that deer decoration, though it doesn't look like it'd last for too many seasons. Big Johnson style and your Cabbage Patch Fever: 30 Years After - Updated Nov 17, 2011. We are planning on performing a Christmas reading of numerous essays, articles, and poems on Nov. 27, Dec. 3 and 4. The location is the Church of Christ, Scientist, Idyllwild, and our usual audience is 25-35 people of whom we ask $12 each. Thank you, and I look forward to hearing from you.